I am here. I arrived safe and sound and from the second I landed until I collapsed into bed at midnight I did not stop walking. You walk everywhere here. I even went grocery shopping and had to walk 10 blocks carrying our food and wine home. I have never based my food decisions on whether or not it's too heavy to lug home. I see why there are a lot of vegans and vegetarians here. It has less to do with ethical eating and more to do with basic physics of heavy food (regardless of what they tell you). The day was filled with shopping and people watching, food from markets and drinking at a pub over looking the ocean. It's humid and super hot. I visited with my aunt all day and had dinner with my cousins Chris and Maclean. There is a magic with cousins. You have the understanding of family but the closeness of friends. 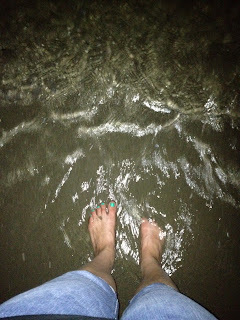 After dinner the three of us walked down to the ocean and splashed and walk on the sand. The water was warm and perfect and I loved how much there is to do at all hours of the day. I see why people love this city. It's peaceful and far from boring. I am grateful for the rain that is coming down while I write this. It smells so crisp, fresh and clean. I love the sounds of rain. I am grateful I slept so well last night. I am grateful, and very content.